This past week at Occoquan Bay National Wildlife Refuge I observed two large birds consuming large fish using very different techniques. The first, a Great Blue Heron (Ardea herodias), carefully positioned the fish and then swallowed it in a single big gulp. An Osprey (Pandion haliaetus), pictured below, used a much slower and methodical approach, tearing small chunks off of the fish. It takes a lot of bites to finish off a fish in this way. In between bites, the osprey would often look around to make sure no other bird was approaching and attempting to steal its catch. When it needed to tug extra hard on the fish, the osprey would sometimes extend its wings in what I assume was an effort to stay balanced and keep from falling out of the tree. I believe that is what was going on at the moment when I captured this image. You may or may not know that I work on boats. For two years, an osprey engaged in just this behavior atop the mast of one of my boats. Every day when I came to work, my first chore was to clean up the leavings from his dinner that had fallen to the deck below. We finally persuaded him to go elsewhere by installing a lightning preventer atop the mast, making perching impossible. Wow. The ospreys look to be messy eaters and I don’t think that I would want to have to clean up after them. Thanks, the osprey is definitely not a fan of catch and release. This one shot tells the whole story. Thanks, Michael. A lot of times my bird photos don’t tell a story and require a lot of explanation. It is an aspirational goal of mine to capture more images that do tell a story. My wife will often point out what insects, birds and animals manage with just their mouth. It really is fascinating. I think I’d go the one-gulp route if I could. The “one gulp” method require quite a digestive system. It is amazing how birds and other creatures mange to get enough food to survive using such an incredible variety of techniques. Nice Mike! Great to see Ospreys returning as it gets warmer. 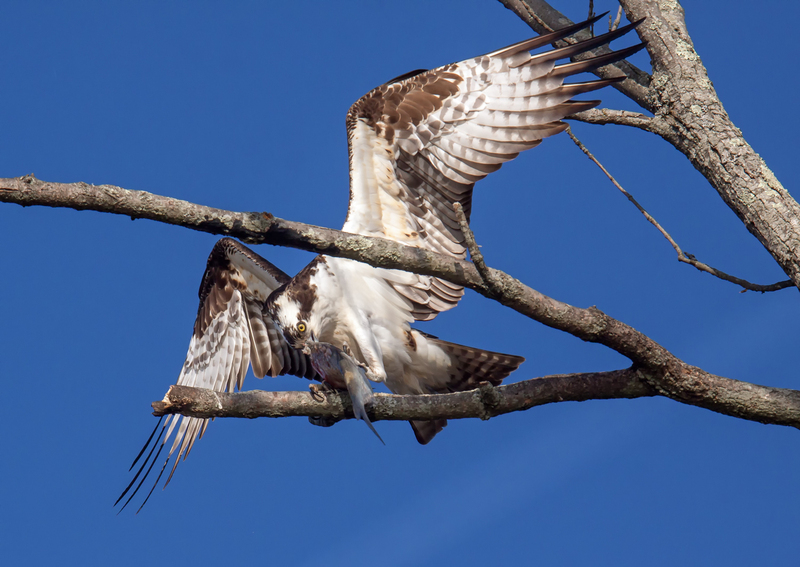 Always fun to photograph Ospreys!